Students in Mrs. Limon’s second grade classroom combined reading and social studies last week while reading about the life of Helen Keller. Students researched facts and wrote a biography about Helen’s life, wrote their name in braille, and made timelines of Helen’s life as well as their own. Northwood Baseball/Softball sign ups are online at CI.NORTHWOOD.OH.US. Just click “summer ball registration”. The last day to sign up is February 10th. Northwood Local Schools invites members of the community, alumni, and guests to tour the buildings currently in operation on our campus prior to their demolition. On Friday, October 7th those interested will be welcomed to the Northwood Elementary Building beginning at 4:00 PM in the cafeteria. There will be light refreshments, student projects, and historical memorabilia on display during that time. The tour will travel through the Northwood Elementary building and then on to Olney Elementary. Following the tour, guests are welcome to tour Northwood High School on their own and are invited to the alumni tent, sponsored by the National Honor and National Junior Honor Society that will be adjacent to the football field. October 7th also marks our annual homecoming festivities and football game which also takes place that evening. The homecoming ceremony will take place on the football field on Friday, Oct. 2nd at 6:30 p.m. Be sure to get to the stadium early so that you can attend the crowning of our next king and queen! 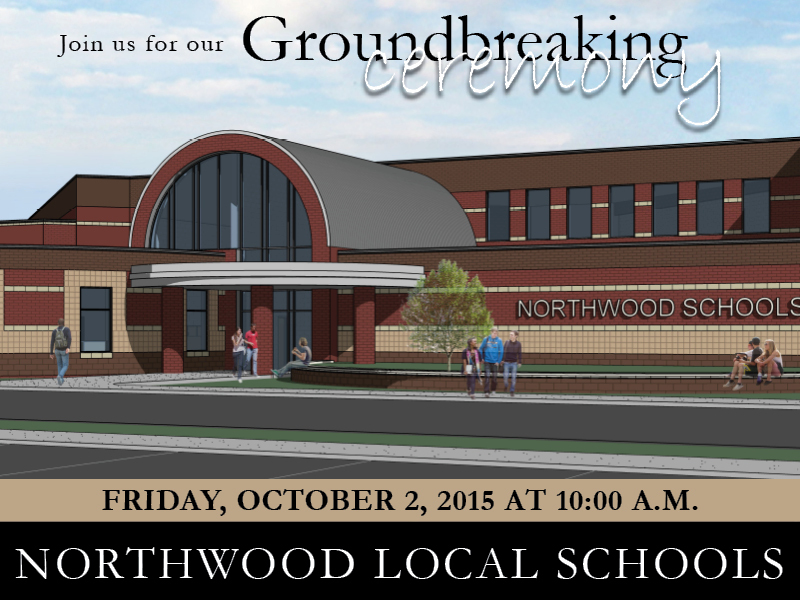 The Northwood Local Schools ground breaking ceremony will take place on Friday, October 2nd at 10 a.m. The ceremony will take place at the High School Stadium (In the event of rain, the ceremony will take place in the Northwood High School Gym) . During this time, there will be several speakers including : Denise Niese (School Board President), Superintendent, Greg Clark and Naomi Smith (Treasurer, Citizens for Northwood Schools). In addition, one of our own Northwood students will speak about what this new building/facility will mean for our students. Senator Randy Gardner will also be in attendance with a special presentation that day. In addition, there will be performances from our Acapella group, choir, band, and cheerleaders. Finally the ceremony will conclude with several community and leadership groups taking part in the ceremonial “turning of the earth” and our student body will join together to sing the Northwood Alma Mater. Come out and support the Ranger Football team as they take on Edon. Alumni Band will take place during the Homecoming Game. Dust off your instrument and join the Marching Rangers! The alumni will practice before the game on October 2nd at 5:30pm. If you can’t get to NHS right at 5:30, just arrive as soon as possible. The band will march out to the stadium at 6:15pm. Also, please let Mrs. Petteys know if you need a school instrument. Contact Tracey Petteys at tpetteys@northwoodschools.org with any questions. Alumni Cheerleaders are needed for the Oct. 2nd Homecoming game! Cheerleaders will practice Thursday October 1st from 4:30 to 6:30 at Olney Elementary. Alumni Cheerleaders will meet at the high school gym on October 2nd at 5:30 p.m. and will cheer the first half of the homecoming game. Please contact Erin Szuch at eszuch@northwoodschools.org for more information!